Applying plastic masking film with a 3M hand masker. Using a hand held masking machine will save time and effort in protecting a surface before painting. Protecting non-painted surfaces is as important as quality paint. Try as you might to be careful, there will always be a need for tape, paper or plastic. Many homeowners try to use newspaper instead of masking paper. Newspaper absorbs liquids very easily allowing them to penetrate to the surface. This is called bleed through. Wet newspaper tears and disintegrates very easily. When masking with newspaper you must position and tape the paper at the same time. This is very frustrating and almost impossible to do in breezy conditions. 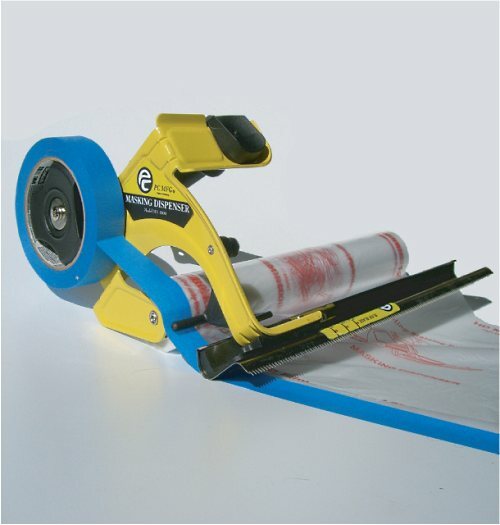 A masking machine is designed to hold both the tape and paper, or plastic film. Merely press on the tape to the large reel and the paper, or film, to the small reel. Unroll a short length of tape and attach it to the paper so it is halfway on the papers edge. Now pull the desired length of paper off the roll and the tape will unwind with half of it exposed. 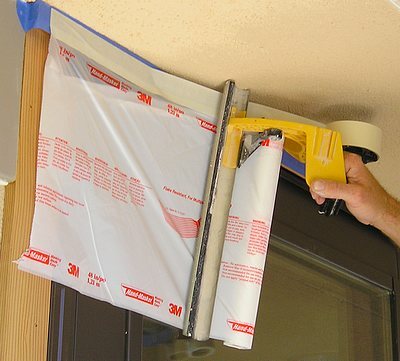 Use this valuable tool for masking and covering windows, doors or almost any surface. The 3M Hand-Masker M3000, see picture above, is designed for professional use. It is durable, impact-resistant and has a lightweight frame. Great for painting (inside or out), drywall texturing and anywhere you need to quickly cover up windows, doors, etc. 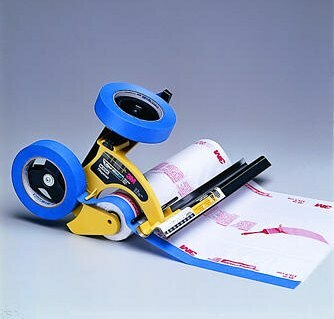 Using a Handheld Masker: Cutting the paper and tape is an easy motion. Hold the tool away from masked surface, tilt blade toward the taped paper and cut through the taped material starting with the taped edge. Now it is ready to be attached to whatever needs masking. The blade of this masking dispenser cuts the paper to the desired length. If plastic film will be used a special blade will have to be purchased. This blade has sharper and more teeth. The blade simply attaches to the masking machine by snapping in place. Accessory blades are available in different lengths from 6 inches to 12 inches depending on paper used. Most models have a 12-inch blade as standard. Be careful the blade is very sharp.